Art. C'est la vie. Life goes on with it's own rhythm and impetus like music. Sometimes I feel part of that energy. Sometimes I feel distanced. I often lose myself in gardening. It's almost like meditating amongst the vegetables and fruits. But it's art, making art, that engages me, interests me and excites me. I like applying paint. I like shaping clay. I like the way new thoughts form during a process. Lately mezzo plates and printing have engaged me. Ideas develop from drawings for me. After the printing, the plates themselves are the most beautiful part of the process, like tiny sculptures. The art school years are never forgotten where sculpture was my main preoccupation for three of the four years there. I still pour over books of sculpture and art history. Sculpture trails such as the bi-annual Waiheke walk, the Botanical Gardens walk and very recently the Wharepuke Tropical Garden walk in Kerikeri, are highlights for me, although I don't like all the sculptures I see., but I do enjoy the search. I find the many different forms of art intensely interesting from jewelry to architecture, from cave drawings to contemporary art, as well as all the ethnic and cultural art between. Amongst my old favourites from the art world are Barry Flannigan's hares for his humour, Charles Despiau for his sensitive portraits, David Hockney for his drawings, Johannes Vermeer for his rich interiors that tell stories, Fernando Botero for his voluptuous visions, and Aristide Maillol for his beauty, also Colin McCohen for his earthyness. I enjoy new voices in the art world such as Grayson Perry. Also Elizabeth Frink for her male images as well as her animal studies. Art is still a world of discovery. 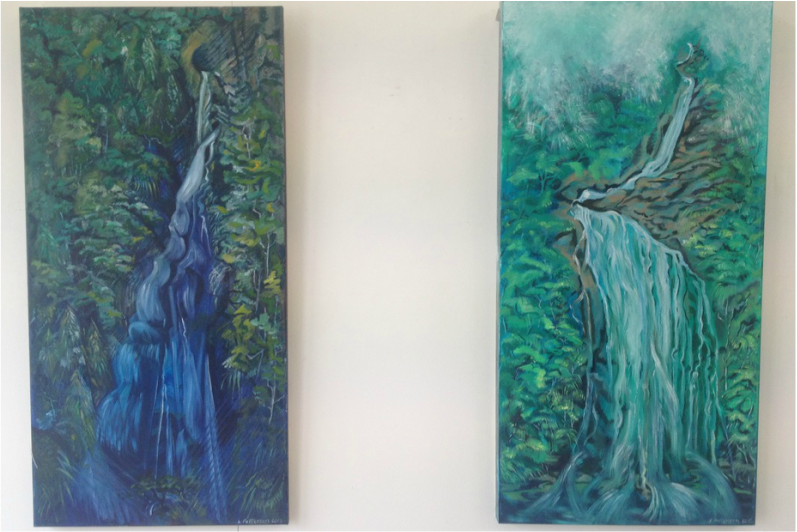 NB: Libby Patterson is a founding member of both Kumeu Arts Centre and the Life Drawing Group. Libby was also a long term tutor for Kumeu Children's Art Club and many other activities in our arts centre (to long to list here) . It is with heavy hearts that we wish her farewell and best of luck for her move up North. We wish to express our deepest love and respect for Libby and her husband (the late Gavin Patterson) and all that she and her family has bought to and done for Kumeu Arts Centre. We are all the better for knowing you and sharing in your bright light. Much Aroha to you Libby.